With Saxton having laid the foundations of English cartography, others were quick to build on his work. The most famous, and the best at being able to blend existing material with new research and surveys, is John Speed. Speed was a Cheshire tailor who felt his main calling to be as a historian and was lucky enough to find a wealthy patron, Sir Fulk Grevil, to support his researches. It is not for his writing, however, but for his Theatre of the Empire of Great Britaine, published in 1610-11 in conjunction with John Sudbury and George Humble, that he will chiefly be remembered. 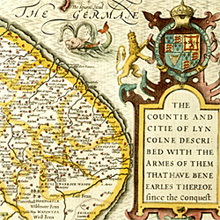 The Theatre included many town plans and, unlike Saxton’s Atlas, provided separate coverage of each of the counties of England and Wales. With five plates covering Ireland and a general map of Scotland, it was also the first atlas of the whole of the British Isles which had, with the accession of James I in 1603, recently been united in the person of its ruler, if not yet administratively. Produced using the same supreme skill and care as Saxton’s had been some 30 years before, the results are equally stunning. Despite Speed’s assertion in the introduction to the long-delayed first edition that ‘I found my selfe unfit and unfurnished both of matter and meanes, either to build or beautifie so stately a project,’ it proved to be a considerable commercial success. Even though the bound edition cost 40 shillings, a massive sum for most Jacobean budgets, reprints soon followed. The British had developed a taste for maps, and in Speed’s and Saxton’s they were lucky to have some of the finest ever produced.